On the 28th of April 2013, a beautiful Sunday morning, I attended the City Harvest Church service at Singapore Expo Hall 1. The service started at 10 am with awesome Praise and Worship. Words fail to describe the beauty and the Glory of God. Although I pen down my experience, there is no substitute to experience the Glory of God unless you’re in Worship. 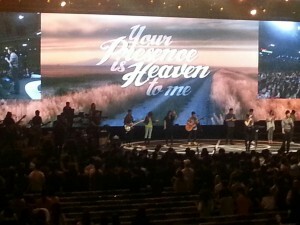 After Praise and Worship, Pastor Kong Hee, shared the sermon – “Your Presence is Heaven to Me“. What does the Bible say about Heaven? It’s a real physical place where there is happiness, joy, no sickness or disease, no sadness. Revelation 21:4 4 And God shall wipe away all tears from their eyes; and there shall be no more death, neither sorrow, nor crying, neither shall there be any more pain: for the former things are passed away. Pastor Kong mentioned that heaven cannot be defined only as a physical place. Wherever Jesus is, heaven is there, because the Bible says “Kingdom of God is within You” – Luke 17:21. The end purpose of God is to form Christ in us. For that to happen, He is chipping away certain areas of our lives, distraction, that prevents us from forming Christ in us. That’s what consecration and sanctification is all about. Jesus is more important than all the blessings He can give us. In the beginning, we want prosperity, we want healing, but now we must cross over. Jesus, I come just for You. You’re all I want. 16 Shadrach, Meshach, and Abednego, answered and said to the king, O Nebuchadnezzar, we are not careful to answer thee in this matter. 17 If it be so, our God whom we serve is able to deliver us from the burning fiery furnace, and he will deliver us out of thine hand, O king. 18 But if not, be it known unto thee, O king, that we will not serve thy gods, nor worship the golden image which thou hast set up. 19 Then was Nebuchadnezzar full of fury, and the form of his visage was changed against Shadrach, Meshach, and Abednego: therefore he spake, and commanded that they should heat the furnace one seven times more than it was wont to be heated. 20 And he commanded the most mighty men that were in his army to bind Shadrach, Meshach, and Abednego, and to cast them into the burning fiery furnace. 21 Then these men were bound in their coats, their hosen, and their hats, and their other garments, and were cast into the midst of the burning fiery furnace. 22 Therefore because the king’s commandment was urgent, and the furnace exceeding hot, the flames of the fire slew those men that took up Shadrach, Meshach, and Abednego. 23 And these three men, Shadrach, Meshach, and Abednego, fell down bound into the midst of the burning fiery furnace. 24 Then Nebuchadnezzar the king was astonished, and rose up in haste, and spake, and said unto his counsellors, Did not we cast three men bound into the midst of the fire? They answered and said unto the king, True, O king. 25 He answered and said, Lo, I see four men loose, walking in the midst of the fire, and they have no hurt; and the form of the fourth is like the Son of God. 26 Then Nebuchadnezzar came near to the mouth of the burning fiery furnace, and spake, and said, Shadrach, Meshach, and Abednego, ye servants of the most high God, come forth, and come hither. Then Shadrach, Meshach, and Abednego, came forth of the midst of the fire. 27 And the princes, governors, and captains, and the king’s counsellors, being gathered together, saw these men, upon whose bodies the fire had no power, nor was an hair of their head singed, neither were their coats changed, nor the smell of fire had passed on them. 28 Then Nebuchadnezzar spake, and said, Blessed be the God of Shadrach, Meshach, and Abednego, who hath sent his angel, and delivered his servants that trusted in him, and have changed the king’s word, and yielded their bodies, that they might not serve nor worship any god, except their own God. Pastor Kong mentioned, Is having Jesus enough for you? Is Jesus more important than your blessing, you healing? Is our Christianity stopping at Jesus my Savior or Jesus my Lord? We will never discover our destiny unless we cross from Jesus my Savior to Jesus my Lord. After the sermon, Pastor Kong led the people into worship. The Presence of God was beautiful beyond description, as Sun Ho sang “Your Presence is Heaven to Me”. I wish I could describe the beauty or put down in words what it is to be in the Presence of God. These are experiences which are beyond description, too marvelous for words. i love d song. thank u for d understanding. i am d lead doer for this song in my church.